That's what has delayed the the Shewri-Nhava Sheva Transharbour Link (or the MTHL - Mumbai Transharbour Link). First, some facts that I know. The MTHL, like many other Mumbai projects, was thought of a long time back (1970 to be precise). As usual, nothing (has) happened. A few years back the Maharashtra State Road Development Corporation (MSRDC) began thinking about building this bridge and bids were invited. When I first posted, there were three groups in the race as follows. At some point of time, the Anil D. Ambani Group (ADAG which is Reliance Energy+Hyundai Construction), joined the race to build the bridge. MSRDC disqualified ADAG from bidding on technical grounds, i.e.because its partner Hyundai had incurred cash losses in the past. Therefore, the combined net cash profit of the Group fell below MSRDC norms, even though other norms were met. (More in this article). And therein began the controversy: how can you disqualify the group when it meets all the conditions except one, which can be a technicality? Not surprisingly ADAG went to court. Two facts to remember (a) elder brother Mukesh Ambani, also in the bid to build the bridge, is at loggerheads with Anil Ambani and (b) MTHL is critical to Mukesh Ambani's Navi Mumbai/Maha Mumbai Special Economic Zone, because the MTHL will link the SEZ to Mumbai. So, chew on this for a minute. From 1970 to 2006, nothing really happened on the MTHL. 36 years nothing. What were our ministers doing? When they did decide to go ahead, the issue went into court. Where are we now? On Sept 11th 2007, the Supreme Court scrapped an earlier High Court order and allowed ADAG to bid for the project. The extended date for filing financial bids now stands at 15th December 2007. The latest update came courtesy a front page HT article last week. The MSRDC had disqualified a Chinese firm from the bidding process on technical grounds, i.e. because the Chinese firm has built a longer bridge at a cheaper cost. This is what MSRDC Chairman, Shri Anil Deshmukh, has to say. The pre-bid qualifications laid down that the bidder should have built a sea link of at least Rs1,000 crore. Their sea link had cost Rs850 crore. Labour and construction material in China is cheaper. Today's Mint carries an interesting interview (link) with Delhi's Chief Minister, Mrs. Sheila Dixit. The interview has been taken from the McKinsey Quarterly (link). Ms. Dixit is now on her second term as the CM of Delhi. Meaning ten years at the helm. The Quarterly: How has Delhi changed during your two terms in office? Sheila Dikshit: If you look at the physical achievements, the infrastructure is much better, the power is much better, water is much better, and transport is better because of the Metro, although not terribly so. I would say it needs another two to three years to put it right. When I look at human development, I think Delhi has changed from a cynical city to a city of hope. And it attracts not just people who seek jobs but also culture now. Almost the entire television industry, for instance, is located in Delhi, whereas Bombay6 used to be the top city. That infrastructure—the dozens and dozens and dozens of flyovers that have come up, the underpasses that have come up—has attracted a lot of labor from outside. Meanwhile, those who were living here were not terribly interested in doing manual labor. So the labor came in, and those who are local have become better educated and are looking for jobs in the service sector. A bit more economic growth has meant more migration, and more migration has meant that we almost keep standing where we are. I've never lived in Delhi and have visited it only a few times in the last few years. Going from what I hear from people, its a transformed city. The Metro itself has led to a paradigm shift in commuting. Sure, there's a lot still to be done (even the CM accepts it in the interview) but that can't take away from the achievements noted above. Even at the Municipal level, the sealing drive under taken by the MCD was a bold step irrespective of the implementation or the results. What have these people done for Mumbai? For a minute, just think what physical infrastructure has been created in Mumbai, since 2004 (the period that has seen India sustain high economic growth, a period that has, and continues to be, critical for Mumbai). What are the achievements of our Chief Minister, Shri Vilasrao Deshmukh. I can't think of any. If you count the Mumbai Urban Transport Project (tag), then most of it is running behind schedule. Ditto, Mumbai Urban Infrastructure Project. Whatever progress (extension and building of new railway lines, ramping up the Express Highways and the link roads) has come months after it was due. The Metro was flagged off a year ago and work will start only in Jan-2008. All other large road projects are stuck somewhere between the courts and the organisations who will commission the project. Housing? Full marks if you're a builder because these last few years would have been very good for you. If you were a prospective buyer, I hope you bought your house soon enough. Electricity? Load-shedding resulted in suburbs like Mulund facing hours of power cuts. As a resident of Mumbai, I can say that life in the last four years has only gotten tougher. There has been some respite at the ward level (construction of drains, widening of roads, etc) thanks to a handful of BMC corporators, but as a city - India's largest - we have moved nowhere. Is money a problem in Mumbai? Well, the Mayor certainly thinks so as she cribs about Mumbai not getting enough, while conveniently forgetting the BMC's own budget. Over at the Metro, the contractor - Reliance Energy - has had problems over viability funding with the MMRDA (and hence the State Government) and even today this Rs650crore remains a problem bouncing between the Centre and the State. Till recently, the Bandra Worli Sealink (tag) was stuck over cost over-run problems between the contractor and MSRDC. The issue is not one of "do we have the money? ", but one of "how are we spending that money?" And how's it in Delhi? Read below. The Quarterly: Is funding a critical constraint? Sheila Dikshit: No, funding is not a constraint. We have very good tax collection and have urged the people not to avoid taxes. We gave concessions where we thought we should, but we were also one of the first states to impose the VAT. Since things are happening here, the central government has been very kind to give us funds. So we are never short of funds. And finally, lessons to be learnt. The Quarterly: How can other Indian cities follow Delhi’s example? Sheila Dikshit: They should be made into city-states,11 and we should start with five cities: Kolkata, Mumbai, Chennai, and so on. I am sure politically no one would agree with this, but I think administratively it would be good for the country’s development. Create city-states and give them the power to undertake development. They should not be under the state governments but rather under their own chief minister or chief administrator or whatever you want to call the position. They would collect their own revenues, maybe sharing a percentage with the other states. You have to develop your cities, especially if you’re envisaging that in the next 20 years 55 to 60 percent of India’s population will be urban. You just can’t do it with the same old administration where you’re dependent on various constituents for every penny. Does any politician or any bureaucrat responsible for Mumbai, honestly even think of mooting that Mumbai be declared a state with its own administration and funding? I doubt it. Who would dare cut the hand that feeds? In many of my earlier posts I've made reference to the fact that a delay by the Maharashtra State Government to repeal the Urban Land Ceiling and Regulation Act (ULCRA) will result in us losing out funds from the Central Government made available under the Jawaharlal Nehru National Urban Renewal Mission (JNNURM). But is the choice that simple? Repeal ULCRA = More money for Mumbai? That's the line being taken by many. But its never that simple. In Mumbai, nothing is. The ULCRA is 30-year old piece of legislation followed more in its abuse. Formed with the purpose of curbing land-hoarding in the hands of a few, the Act empowered the State Government to acquire "excess" land and then release this land for public use. Sounds good, doesn't it? If Person X has loads and loads of land, then what's wrong if he surrenders a bit of it to the Government who then gives it back to the aam janta in the form of low-cost housing. If only it was that simple. Ironically, even with all the discretionary power that the ULCRA gave to them, State Governments just couldn't work it right. They just couldn't - didn't - acquire surplus land. Besides, land owners, and Governments, conveniently circumvented the Act using the "exception" clauses that the Act contained. Now, to put numbers to it, consider this nationwide data (source). Actual excess land exempted under the Act: 61,967 hectares. Now, if that's not a case of failure, what is? Thankfully, but after a lot of debate, the Act - on a Central basis - was repealed in December 1998. Eventually a number of states that had implemented this Act followed suit. Delhi, for example, repealed the Act five years ago. But Maharashtra - and hence Mumbai - has not repealed this Act. Our Chief Minister promised to repeal it last year, but the motion didn't make it through last years winter session and this year's monsoon session of the Legislature. Best chance now? This year's winter session. For a minute, lets take a contrary view, i.e. is there a case for ULCRA to remain in action? After all, if implemented properly, the Act can achieve its intent, i.e. cool property prices and provide low-cost housing in a city where "affordable housing" is a dream. Take for example, this article in today's ET. 84 year old, veteran Janata Dal (Secular) Leader P.B. Samant wants Maharashtra's Chief Minister, Shri Vilasrao Desh to convince him that repealing the Act will be beneficial. The octogenarian leader referred to a successful housing project undertaken by Nagari Nivara Parishad for 6,000 families in Goregaon under ULCRA. “This demonstrates that the Act can still be implemented for the larger good of the people in Mumbai if the government has the will,” he added. The state government has proposed to repeal the Act in the winter session of the state legislature in December. “If the Act is repealed, around 30,000 acres of land would be released to real estate market players, who would certainly not use it for the benefit of an average Mumbaikar,” he said. Indeed, who can argue with that? Shouldn't the State Government first implement the Act in its spirit before repealing it? But, doesn't past experience tell us that this Act can't be implemented? So, can we trust our politicians to actually execute this Act? Even if they do start implementing it, what if land-owners go to courts and delay the process? Even if the Government acquires land, then who will monitor the process of the surplus land reaching its ultimate end-use, i.e. low-cost housing? Is there any regulatory system in place to ensure transparency in this land-release? As always, too many questions, too few answers. If, and when, ULCRA is finally repealed, the process will take time and it won't be transparent. Look at Mumbai's Mill Lands. The Supreme Court verdict (allowing for re-development of the mills) was in March-2006, and even today a year-and-a-half down the line, mill owners, the BMC and MHADA are all fighting over who gets how much land and when. 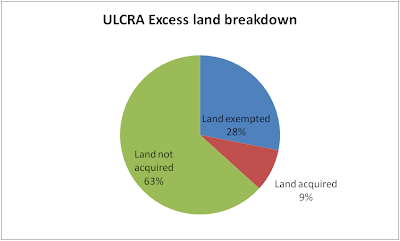 So, even if the ULCRA is repealed, I doubt it will be an easy process and I doubt if it will result in vast tracts of land coming into the market on one fine day. This is Mumbai. Nothing is simple, nothing is easy. And when it has to do with land, land worth thousands of crores, it will take time. Lots of time. Time that this city never had. Question of the day - Which Indian state tops the list for availing Central Government funds for city projects, under the important Jawaharlal Nehru National Urban Renewal Mission? Answer - Maharashtra. For 47 projects, the state has drawn funds of Rs 6,396 crore. (Source: today's TOI. E-paper link here). While the TOI article is based on a report that I can't find, data just prior to this report is available on the JNNURM website. 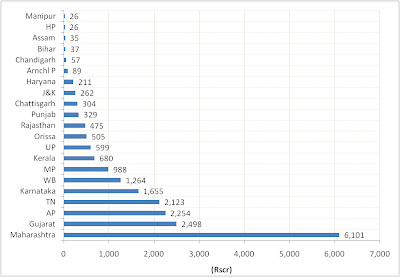 This is a chart based on this data (accessable as Google Spreadsheet here). What I can't figure out is how much of this money has come to Mumbai. Or wait, does the fact that the Urban Land Ceiling Regulation Act (ULCRA) has not yet been repealed in Maharashtra have anything to do with that? I doubt it, since the state (not the city) tops the country in taking JNNURM funds. Yet, funds have never been a real issue for the city. Whether through the State Government, or Central Government or even the BMC's huge annual budget. That's among the reason I'm not a big believer in the theory that "Mumbai gives so much to the Centre and we get nothing back". Well, I don't know about that now, considering that the state to which the city belongs to, gets the most from the Centre's scheme for urban renewal. Reason for delay: Reliance Energy had moved the court against MSRDC disqualifying its bid to build the bridge. Supreme Court lifted the order and extended the date for filing bids to Dec 15th 2007. High Court clearance also awaited.